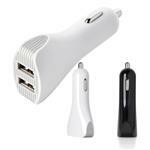 3 Port USB car charger. 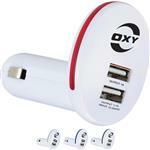 Recharge three mobile devices at a time while driving in the car. Includes a power indicator light. Input 12-24V/Output 5V 3.1A. Contains an intelligent IC chip for full protection of overcharging, over discharging, overloading, short circuit and high temperature protection. FCC, CE and RoHS certified. 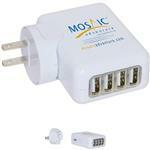 Now you don't have to fight over who gets to charge their mobile device. Adco Marketing - keeping the peace! Typical Imprint Area(s): 3/4" (w) x 3/8" (h) per side. Available Imprint Options: Color Print - includes 1 side, 1 color. Full Color Available for an extra cost. 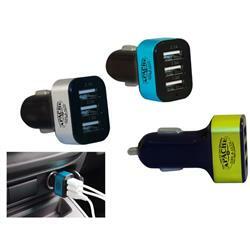 Recharge three mobile devices at a time while driving in the car. Includes a power indicator light. Input 12-24V/Output 5V 3.1A. Contains an intelligent IC chip for full protection of overcharging, over discharging, overloading, short circuit and high temperature protection. FCC, CE and RoHS certified. 35 pounds per 500 pieces.